Cosmo is our beloved companion who we were blessed to get from German Shepherd Rescue 9 years ago. He recently became very ill and after several vet visits and specialists, we got a brain MRI and discovered he has a huge brain tumor. While we could try surgery, the prognosis for a recovery is grim. While we are not ready to be separated from him, we cannot stand to see him suffering. We are so devastated; my grief is caving in upon me. We brought him home from the hospital for a couple of days to say our goodbyes. He has brought pure joy to my life. I pray I will meet up with him and my other GSD, Misty, who is still with us, when I pass. I will love you forever, Cosmo. I will love you forever. When I get to Heaven I know that you and God will be there waiting for me. Take good care of my grandchild:-)! Go walking with my Uncle Peter, your namesake. I be there soon, LOVE :-)! :-)! We lost our GSD too. 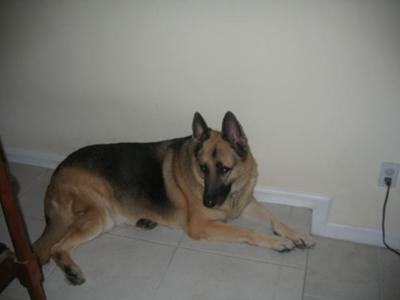 We lost our GSD, Ava, on August 27, 2010. She fell sideways on her bed and was gone instantly. The Vet thinks she had a heart attack, stroke or aneurysm. We got her when she was four and would have had her five years on Jan. 8th of 2011. We think she passed at about nine years of age. She was a wonderful, patient, kind and loyal dog. We miss her more than words can say. I feel your pain in the loss of your beautiful GSD. I just recently lost my dear friend Saushau. I had her for 12 years, and found her on Sunday morning March 21, 2010, so I know the grief of your heart. I do believe that we shall see them again. Just this side of Heaven is a place called Rainbow Bridge. When an animal dies that has been especially close to someone here, that pet goes to Rainbow Bridge. There are meadows and hills for all of our special friends so they can run and play together. There is plenty of food and water and sunshine, and our friends are warm and comfortable. All the animals who had been ill and old are restored to health and vigor; those who were hurt or maimed are made whole and strong again, just as we remember them in our dreams of days and times gone by. The animals are happy and content, except for one small thing: they miss someone very special to them; who had to be left behind. They all run and play together, but the day comes when one suddenly stops and looks into the distance. The bright eyes are intent; the eager body quivers. Suddenly he begins to break away from the group, flying over the green grass, his legs carrying him faster and faster. Then you cross Rainbow Bridge together......."
The pain is unbearable at times, this I know as I lost my beloved Golden North 07/23/2009. I still grieve to this day and regret that I could not do more for him. The pain will ease, I'm sure one day. I pray for you and your family during this difficult time. I remember how hard it was for all our family when we lost Murphy several years ago under similar circumstances. I can feel your sadness, but cherish the good memories. Cosmo had the greatest companion people and I am sure you had the best dog. We will always have our hearts full of the love brought to us by them. Remember to take care of you. He wants that. I lost my Laddie in September, still cry, had a hard Xmas, the first in a long time without him. But I remember all the joy he gave to me and my heart sings! Now I am knowing I will see him again. I'm so sorry for your loss. Like others, we have our arms around you, knowing your loss. I lost my dachie Dec 13th 2008. I still cry. He was 13. My hugs and sympathies are with you.